Geostatistical layers created by 3D interpolation methods can predict values at any location within the 3D extent of the layer. To allow you to explore the predicted values within this 3D volume, the layer is rendered as a horizontal slice at a given elevation. The layer automatically configures range properties so that the current elevation of the layer can be changed at any time with the Range slider. When the elevation is changed, the layer updates and renders to reflect the predicted values at the new elevation. This allows you to use the range slider to iterate through different elevation values and see how the predictions change. Once an elevation value is specified, these layers are no different than any other geostatistical layer and support all of the options supported by geostatistical layers, including symbology, export options, and the ability to be edited in the Geostatistical Wizard. The geostatistical layer is rendered at two elevations. 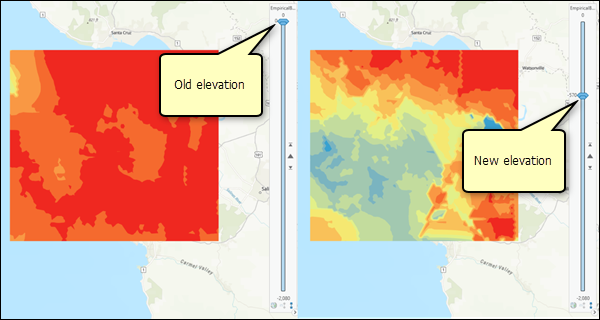 Because geostatistical layers require a single elevation value, if a span interval is defined for the range slider, the largest value of the span will be used as the elevation. If a geostatistical layer created from a 3D interpolation method is added to a Scene view, the layer will render at the current elevation of the layer. Changing the elevation of the layer will shift the layer vertically to the new elevation. A wireframe box is drawn around the 3D extent of the layer to show the elevations that can be used. This box can be turned on and off on the Appearance ribbon tab of the layer. A geostatistical layer in a Scene view is shown. Geostatistical layers in 3D can be exported to rasters, feature contours, and points. A raster of the horizontal slice at a given elevation can be exported using the GA Layer To Rasters geoprocessing tool. By default, the tool uses the current elevation of the geostatistical layer, but other elevations can be exported using the Output elevation parameter of the tool. To export rasters for multiple elevations, such as creating a raster every 10 meters, you can use batch geoprocessing, ModelBuilder, or Python scripting. Contour lines or filled contour polygons can be exported from a given elevation using the GA Layer To Contour geoprocessing tool. By default, the tool uses the current elevation of the geostatistical layer, but other elevations can be exported using the Output elevation parameter of the tool. 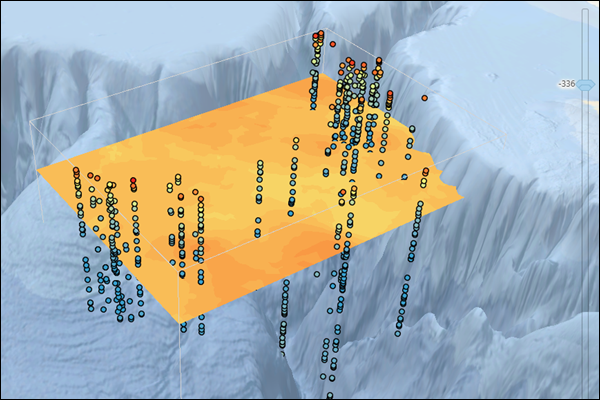 Geostatistical layers in 3D can also predict to 3D point feature class with the GA Layer To Points geoprocessing tool. This allows you, for example, to predict to target points in 3D and symbolize the points by their predicted values. If the target points store their elevations in an attribute field (rather than Shape.Z), you must provide the Elevation field and Elevation field units values. 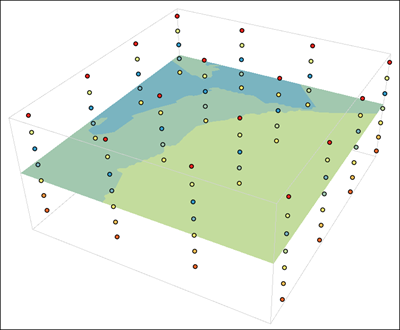 A geostatistical layer and predictions to gridded points in 3D are shown. What is a geostatistical layer?